The headquarters of the Leningrad naval base is being transferred from the famous Admiralty building in St. Petersburg to Kronshtadt outside the city. Many assume the Russian military is preparing to transfer the Russian Navy's main headquarters, stationed in Moscow, to St. Petersburg. Although this move hasn't been confirmed or denied by the main headquarters, an anonymous source there admitted that its admirals are preparing to move to a new station. The transfer should be final in the second quarter of 2009. The idea to transfer the Moscow-based main headquarters to St. Petersburg was voiced by State Duma Speaker Boris Gryzlov last year. The initiative gained extensive support from St. Petersburg Mayor Valentina Matviyenko. The two politicians say Moscow is overloaded with administrative functions. 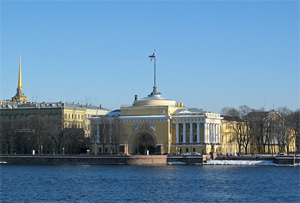 The transfer would align naval practice with naval history, as St. Petersburg was the station of the Russian Navy's main HQ before the 1917 Revolution. Moreover, the city and its suburbs host many naval training schools, including the Naval Academy, as well as a number of major naval research institutions and design bureaus. A series of shipbuilding plants are situated along the river Neva, including the Rubin Central Design Bureau, which engineers ballistic missile submarines. Feedback on the initiative has not all been positive. The transfer of the main headquarters to St. Petersburg would hamper the current close cooperation between the Navy's command and the General Staff of the Defense Ministry, parliament and government. In the U.S., the general staffs of the Army, Navy and Air Force and the Joint Chiefs of Staff are all stationed at the Pentagon, and no one has ever tried to station the top admirals somewhere closer to an ocean, for example, at Norfolk. Additionally, St. Petersburg lacks the infrastructure needed for sustained and secure functioning of the main headquarters, including alternate underground command centers, a major communications center and many other facilities which are necessary in times of threat. It should also be noted that the Leningrad naval base headquarters will have to leave the Admiralty building together with the Naval Engineering Institute, which provides training of officers for nuclear-powered submarines. It is impossible to transfer all of the institute's hardware, including operating models of nuclear reactors, submarine compartments fitted with strategic training equipment and weapons systems, and rescue chambers, a fact which will damage the school's performance for many years. Navy veterans, among them several former chiefs of the main headquarters, are also alarmed, saying the absolutely unnecessary transfer will require enormous funding of as much as tens of billions of rubles, which instead could be spent on housing construction to accommodate officers and their families, as well as to build warships, too few of which were manufactured in the recent 15 years. At a press conference with Russian journalists this April, Navy Commander Admiral Vladimir Vysotsky dismissed the idea of the main headquarters transfer, saying: "I have seen no written directives or other formal documents on the transfer of the main headquarters to St. Petersburg." Now, he appears to have been dodging the truth. The transfer is being performed quietly, in strict secrecy, as if the Russian Navy's top brass are not absolutely sure they are doing the right thing.